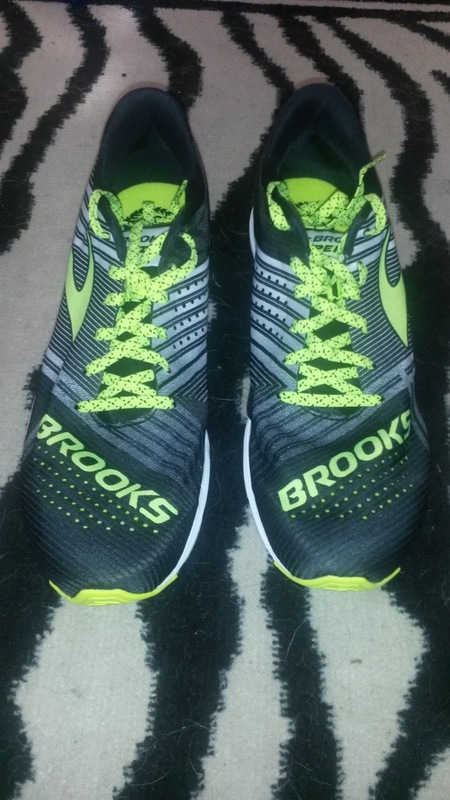 Sole/Ride: Brooks has completely changed the sole and a bit of the ride of this shoe. The Hyperion is still the same versatile racing shoe, but is more aggressive than the T7 racer. While the T7 was on the softer side of firm and responsive, the Hyperion is definitely more on the straight firm and responsive sole feel. The new Biomogo DNA responds much faster to speed than previously. Additionally, the propulsion pods in the forefoot do actually add a subtle pop and add to the overall responsiveness of the shoe. The protective midsole, particularly in the heel, is the type that will keep you from getting too beat up during long workouts or races. The forefoot obviously thins a bit with the 10mm drop, but is more substantial that the thin forefoot of the T7 Racer. The thicker forefoot in combination with the propulsion pods adds not only protection but additional responsiveness when you land there. So overall a fast feeling shoe. The weight of the Hyperion is a little over 6.5 ounces is an increase over the T7 Racer, but the increased responsiveness and protection makes up for the weight increase. The sole of the Hyperion is much narrower throughout than the T7 racer for the same size. While it was narrow in the T7, particularly in the midfoot, the Hyperion is narrower throughout, especially in the heel and midfoot. The narrowness reminds me of the Streak XC where my my heel felt like it was falling off the medial side of the heel. So not the most stable ride, but those with narrow feet will most certainly enjoy this shoe (see my comments on the upper). What I am a little disappointed about is that the heel of the Hyperion does not have the classic curve that I have learned to associate with Brooks. In fact, it even juts out a little posteriorly. So where the T7 racer had a smooth heel landing despite the +12mm heel drop, the Hyperion feels ever so slightly jarring with a heel landing even with a lower ~10mm drop. 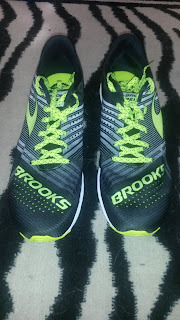 The midfoot and forefoot feel fantastic and smooth, I'm just surprised such a key Brooks element was left out (Don't even think of starting a heel vs forefoot strike debate here. Your initial contact point on your foot is 99% of the time a result of what is happening at your core, hips and everything above your foot. Do not tell me one small distal part of the chain is the most important part. That would be incorrect). 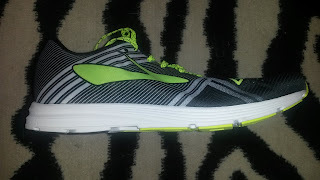 Upper/Fit: The T7 had an upper than I wanted to love but had many rough spots that left blisters when running sockless. This has been completely fixed in the Hyperion racer. A quick test of the upper feel reveals immediately that the interior upper was designed to be run in sockless. It is an extremely comfortable material that feels fantastic against the skin. Additionally, the forefoot area has a thin, very breathable mesh that airs the shoe out nicely. While the Hyperion is made to be run in sockless, if you want to do that I might suggest sizing down a half size as the shoe runs long and narrow. This is different from the T7 that was a bit short but had a just enough room laterally. This is definitely a shoe to try before you by in regards to fit. Those with long narrow feet will love this shoe as that is the general shape throughout the shoe in the heel, midfoot and especially the forefoot. 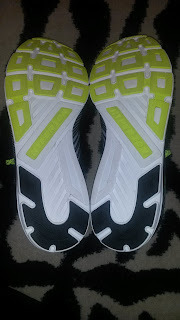 The forefoot is far narrower than the T7 but the mesh is more flexible, so there is a bit of tradeoff. I was a little disappointed in the laces. As I tied them, I had to tie the top very tight along with doing a bunny loop/lace lock technique to hold them in place as the middle laces especially slipped and did not hold. This is one of the first times this has happened. I would hope switching out the laces would fix this issue but I am not sure as the laces appear high quality. I do not know how well they will hold once you tighten them down on long runs or workouts, but I will have to have the money to buy a pair and keep them to find that out. Thoughts as a DPT: Again I am a bit surprised by the posteriorly protruding heel midsole on the Hyperion as well as the increased sole narrowness of the heel. As I have stated before, a posteriorly protruding heel can cause an early initial contact before the lower extremity muscle have truly prepared for landing. Your quads, hamstrings, glutes, and tibial muscles all brace for every impact and have a certain way of doing so. Landing before those muscles are reading will cause more of the impact forces to be dealt with by the joints and bones rather than being appropriately absorbed and dissipated by eccentric muscle loading. The protruding heel combined with the very narrow heel and midfoot does not make for a great or even partially stable landing zone. 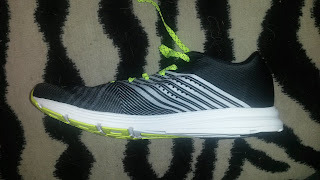 Thus if you want to run in this shoe, you should make sure you have appropriate muscular mobility and stability in your core, hips and ankles to ensure to properly clear your foot and do not load to heavily through the posterior heel. The extra narrowness overall of the sole was also surprising and a bit disappointing. If you have already narrow feet, this will most likely not be as big of a problem for you. Those with wider feet will have more foot surface area to deal with on a narrower shoe, which is inherently more unstable. It is especially odd that this shoe got narrower compared to the T7 but increased in weight. I assume this is likely due to the increased stack height, but again want to reiterate that it does not feel as stable. It is true that I run frequently in stability shoes and have some hip and ankle instabilities going on, so this is likely just my interpretation to this shoe. However, a narrower sole means a less stable shoe which means propulsive forces may not get pushed in the right direction. There is obviously a balance between having the sole just the right width as once you get too wide the shoe starts to feel VERY slow (ie most traditional Hoka trainers) likely due to almost complete elimination of the lateral motions of the foot. A wider shoe base is a more stable shoe. A shoe that has too wide a base will limit motion in the foot. You want this to be balanced, like most things in life. Conclusions: I am extremely impressed with the improved responsiveness of the sole as well as the extremely comfortable upper of the Hyperion. On the other hand I am disappointed in the change in fit and narrow sole. Every update has it's good and bad. I do think the Hyperion is a step in the right direction as it feels like a very serious racing shoe. With continued tweaking I think this will be an amazing shoe. 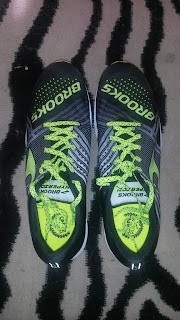 Right now I think many people will enjoy this shoe as a versatile racing and workout shoe, particularly if you have narrow and long feet. 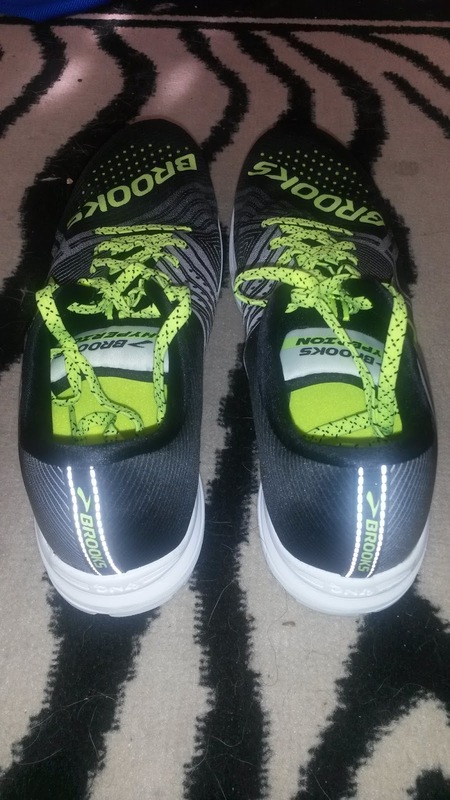 It is one of the first shoes I feel was specifically made for sockless running but you should approach that statement with caution as I have not been able to do long sockless miles in this shoe yet. As always you should try these shoes on before you buy them. The Hyperion is particularly one you should follow this rule for due to the narrower and longer fit as well as the narrower sole. 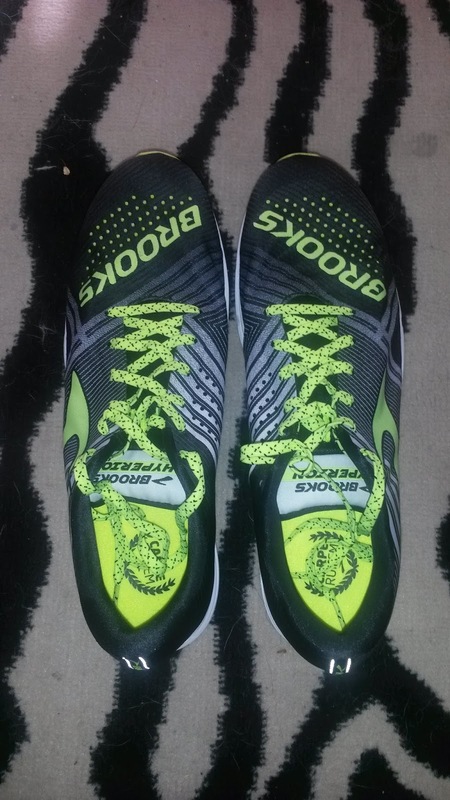 Disclaimer: These shoes were a personal purchase from Running Warehouse. 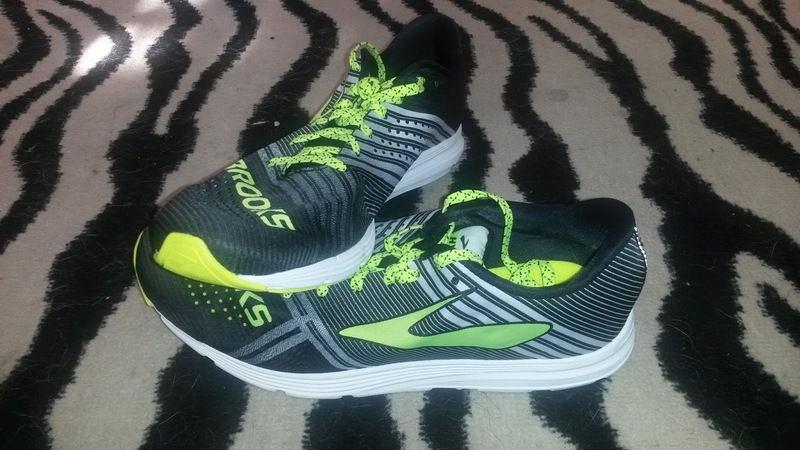 I did run briefly on the road with paces ranging from easy running to all out sprinting to test the shoes out but no more than what I would do testing shoes at a local running retail store. Due to financial reasons I will likely have to return these to Running Warehouse until I am able to start my job as a physical therapy licensed applicant in August of 2016. If I do win a race that has free shoes as first prize, these will be up towards the top of my list.